Everything’s blue, stylish and slick. I’m staring at a small circle of alien sea in an interface the color of the open ocean, with a couple of meters, a small text window and a handful of buttons lingering on the minimalist screen. The topography of this foreign planet swirls in the background as I slip between my sonar and a compass to search for a missing colleague. I’m controlling an AI in a dive suit worn by a doctor named Ellery Vas, and whatever body of water we’re in is as unknown and unknowable as the deepest depths of our own oceans here on earth. The sonar picks up blips that might lead me to my partner; the compass guides me there, and the bit of story I uncover then spurs me on to the next blip, and the next after that. 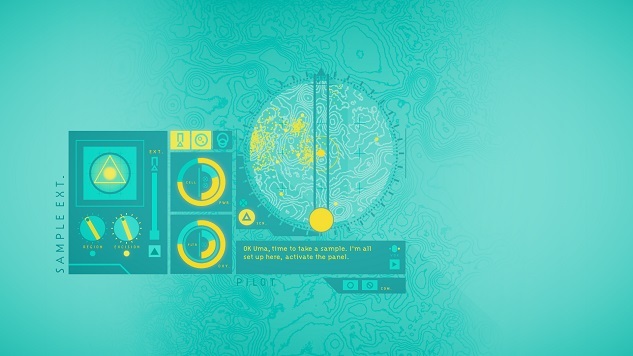 This is In Other Waters, a game from journalist, artist and designer Gareth Damian Martin. (No relation.) Imagine a small sliver of the expansive sci-fi exploration of No Man’s Sky, with a similar sleek aesthetic and gurgling electronic score, but in a design that’s so clean and minimal that it feels like a particularly elegant smartphone app. It’s an ambitious game that’s practical about its limitations, counting on the intrigue of its story and the mystery of its environment to hook players who might otherwise overlook games that are so visually austere. In Other Waters sits somewhere between a Twine game and the sort of esoteric science-based instrument-twiddling that could be found at certain installations in the early days of Disney’s EPCOT. It’s heavily narrative-based, but the visual element as I track and scan leads is also crucial. And from what I’ve played that story doesn’t fall prey to some of the more common missteps of videogame writing—it’s neither over- nor underwritten, largely avoids language that’s either too florid or overly technical, and doesn’t forget to develop its characters into recognizable people. It’s smart, and capable, and, yes, that instrument-twiddling captures a bit of the spirit of playing with toy instrument panels and fake science tools as a child. It also understands that travel and exploration isn’t a straight line. As I follow lead after lead I double back, return to waters I’ve already waded through, in pursuit of my friend. Apparently my suit will develop a small selection of additional skills during my mission, turning this into a Metroid-style game of a sort. There’s enough meat here for people who think games need to hit a certain level of action-based interactivity, and the full package is sewn together in a sophisticated and seamless fashion. If this full alien ocean is ever available to fully explore, I’ll be ready to dive right back in. In Other Waters is currently running a Kickstarter campaign through Thursday, March 8. You can find more information at that page, including the same playable demo that I’ve played.